The R-6 Hoverfly II was developed to improve on the successful Sikorsky R-4. In order to enhance performance, a completely new streamlined fuselage was designed and the boom carrying the tail rotor was lengthened and straightened. 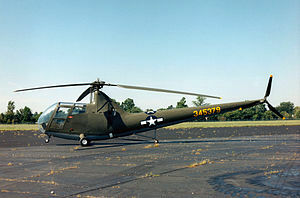 The main rotor and transmission system of the R-4 were retained. 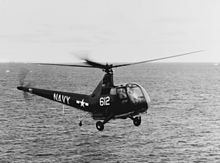 Sikorsky allotted their Model 49 designation to the new design. Later, dynamically-balanced modifications to the rotor were carried out by Doman Helicopters Inc. The new aircraft could attain 100 mph compared with 82 mph by the earlier design. The first R-6s were delivered to the United States Army Air Forces (USAAF) in late 1944 and some were transferred to the United States Navy (USN). It was initially intended to pass 150 R-6s to the Royal Air Force (RAF), but delays caused by the switch of production from Sikorsky’s factory at Stratford, Connecticut to Nash-Kelvinator at Detroit Michigan meant that only 27 R-6As were actually delivered to the RAF as the Hoverfly II. 15 of these were passed on to the Royal Navy’s Fleet Air Arm (FAA).